Triton Bay is located in the Kaimana Regency, located in West Papua Province in Indonesia. It is on the western side of the wider island of New Guinea. In 2008 Kaimana Regency designated 6,000 square meters of land as a special Marine Protected Area and, along with neighboring Raja Ampat and Cenderawasih Bay, Kaimana it is part of the Bird’s Head Seascape. It also sits at the center of the famed Coral Triangle which has the claim to fame of being the home of more species of fish and coral than any other spot on earth. This has also led to Kaimana being known as the Kingdom of Fishes due to the sheer amount of diversity on offer here, with new species being discovered all the time. Triton Bay and the Iris Strait nearby is often less visited due to its isolated location but it has made a name for itself among serious divers as the place to come in Indonesia if you are looking for abundant marine diversity, and a serene atmosphere away from the crowds. With that in mind, it is certainly worth the trip if you are looking for an exquisite dive location that has yet to suffer from overexposure. 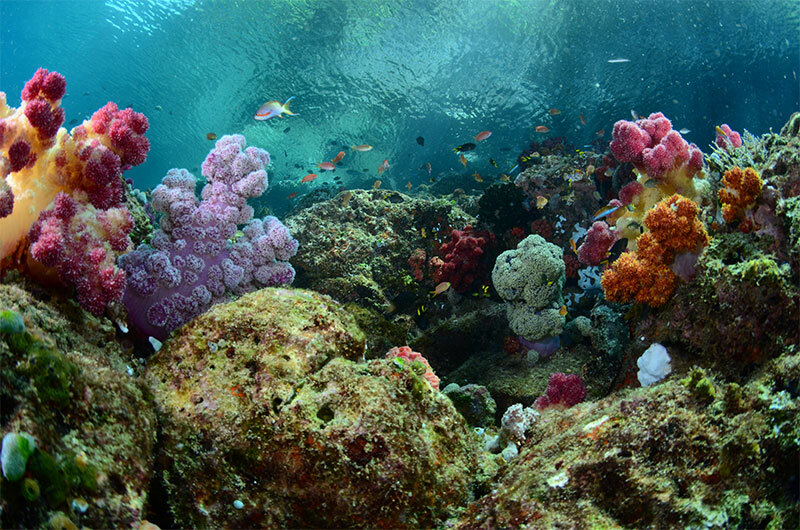 Pristine and wide variety of corals and sealife. Triton Bay has a range of dive sites that offer a wide plethora of underwater delights to explore. The big showstoppers in Triton Bay are the soft coral gardens which are made up of majestic boulders covered in pretty corals as well as large black coral bushes that dance in the gentle currents. Dive spots include pinnacles as well as drift and wall areas. When it comes to aquatic life you can expect to find species that are common across the rest of Indonesia and more. Some of the highlights however include the bobbing pygmy seahorses as well as elegant whale sharks. It is also possible to spot dolphins and marlin here as well as walking sharks which can be difficult to find in other waters around Indonesia. As if that wasn’t enough, you can also look out for the walking shark which is endemic to the area, and the flasher wrasse which is often found around Triton Bay in Kaimana or in Misool in the south of neighboring Raja Ampat. There are upwards of 30 dive sites around Triton Bay and the Iris Strait which sits between the Aiduma Sea and the mainland. Many of the top sites were discovered as recently as 2006 by the team working for the Conservation International Survey. Some of these spots are suitable for day and nighttime dives and if you like sunset diving then you definitely won’t be disappointed here. There is good diving to be had in Triton Bay, or you can venture out a little further to Namatota Island and the reefs that sit offshore from Dramai and Pulau Aiduma. Most of the dives in Triton Bay take place at around 20 meters (60 feet) and the shallower dive sites have the best corals and the largest schools of pelagic reef fish. You can expect visibility to be around 10 – 20 meters (30 - 60 ft), with visibility less in the afternoons. But the abundant diversity makes up for the visibility. 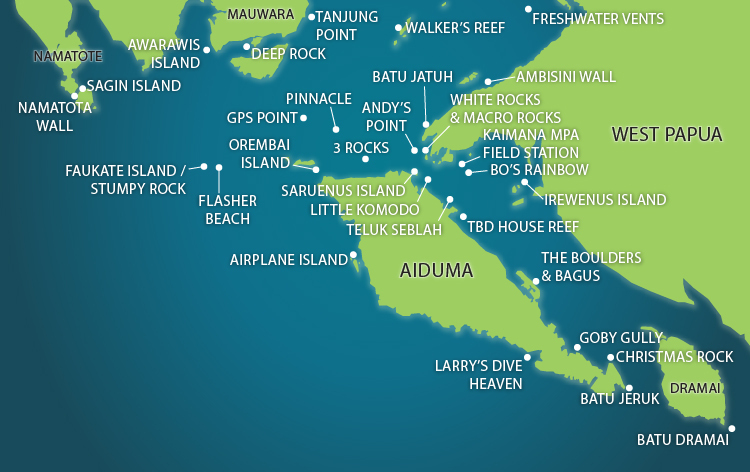 Also known as Pulau Aras and Pintu Aras, Saruenus Island gives you a range of different dive experiences in one spot. Here you will find craggy boulders that stretch almost to the surface of the sea which are laced with soft corals and flecked with darting schools of fish like anthias, fusiliers, and damsel fish. Snapper, sweetlips and hunting jacks hide behind the impressive black coral bushes and this is a great place if you like macro photography. There is also a wall dotted with soft corals that leads to other popular dive sites. 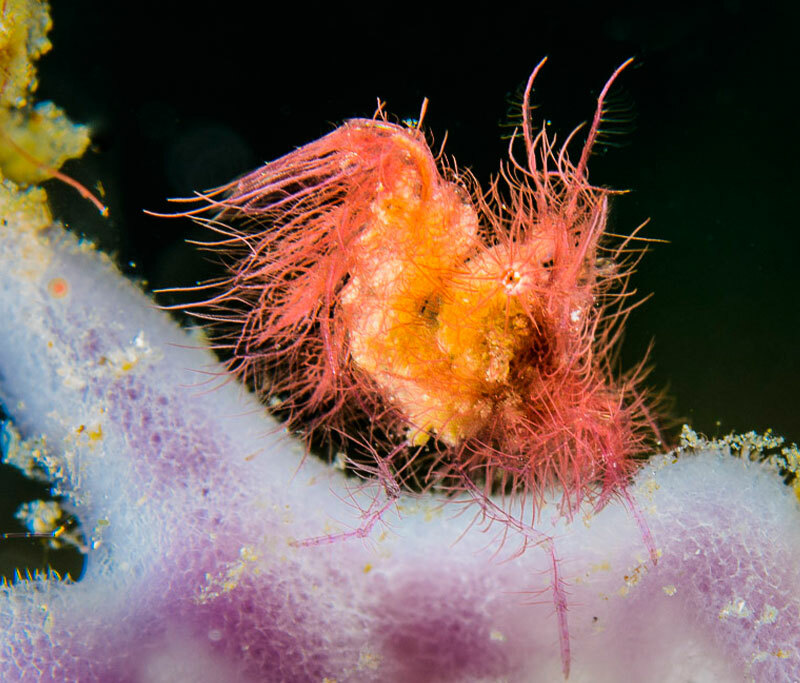 Tiny hairy shrimp sitting on a sponge. Bo’s Rainbow is another area around Kaimana which has large boulders and soft coral gardens. The beauty of this dive site is that it is shallower than many others and slopes downwards to a depth of 16 meters (50 ft) which makes it perfect for both macro and wide angle photography if the conditions are clear on a sunny day. Schools of colorful fish dart around the boulders and make this a good spot for less experienced divers. You can choose to dive at White Rock either at night or in the daytime and it is primarily known for its abundance of cute candy crabs. You will also find soft coral bushes and a sandy slope that goes down to a shallow 14 meters (45 ft) in depth. It’s a great place to try out some macro photography and you will find a mix of species like frogfish and wobbegong sharks. If you are searching for walking sharks which can prove elusive then this is one of the better sites to try. Andy’s Point has made a name for itself thanks to the wealth of species on display here and even if you dive here several times you will probably spot something different on each occasion. Just some of the aquatic life here includes yellow fin barracuda, devil rays, parrot fish, wobbegong sharks, and solar powered nudis. It’s also a good location for the sweet pygmy seahorses for which Kaimana is known but you should note that the visibility here is not as clear as some other spots. The currents are also known for being changeable and fierce so make sure to always take advice from your dive guide when exploring. Batu Jatuh means Fallen Rock and is made up of a mix of hard and soft corals. This makes it very photogenic if you like underwater photography and you will find bat fish, midnight snapper, napoleon wrasse, hunting jacks, and parrot fish here. If you like rays then Eagle rays, and Devil rays may also be spotted here. Flasher Beach is also known as Secret Beach and sits off a small island off the coast of Triton Bay. 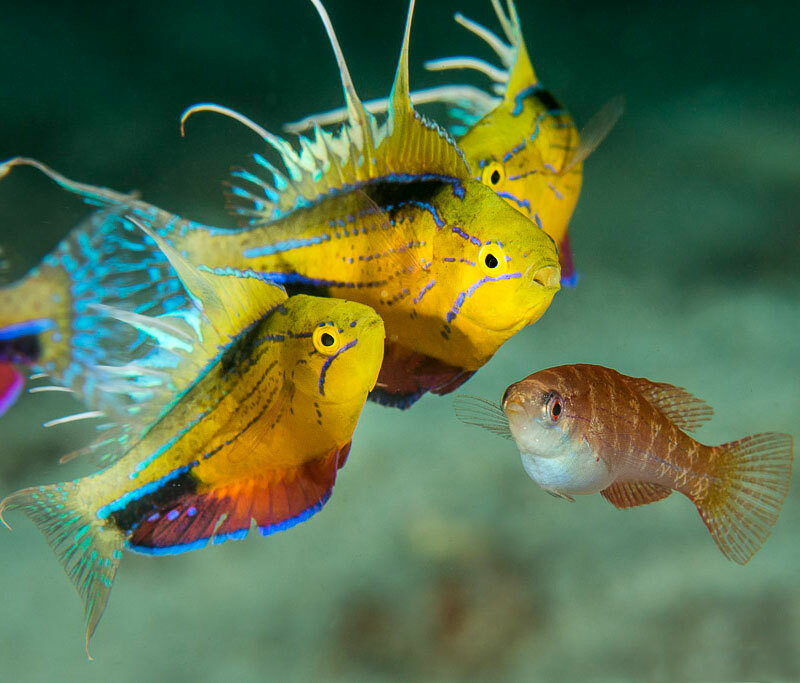 It is named after the Flasher Wrasse that congregate here and which are known for being some of the prettiest and most colorful reef fish in these waters. The male fish perform mating display in the afternoon, so if you want to get the full vibrant experience then this is the best time to dive here. Mating dance of the Flasher Wrasse is mesmerizing to watch. Saron City also goes by the name TBD House Reef and is filled with mandarin fish, flasher wrasse, and saron or marble shrimp. You will also find spotted bob tail squid and starry octopus although the best time to see these is during a night dive. Close to the shore line of Triton Bay is the Boulders which, as the name suggests, is made up mostly of large rocks which are the home of sea fans and soft coral gardens. Wide angle photography is a good choice here as you can see glass fish and fusiliers, or if you like macro pictures then you can search for the bobbing pygmy seahorses that call the boulders home. If you are very lucky and keep a keen look out you may even spot sea bees. Whale shark can usually be seen during the new moon phase. 28 - 29°C (82 - 84°F); can drop down to 24°C (75°F) at the change of seasons. The best time to visit Triton Bay is from late September onwards to mid-June. During this time, you can expect good visibility of around 10 – 20 meters (30 - 60 ft) and water temperatures are usually around 28 - 29°C (82 - 84°F), but water temperatures can drop down to 24°C (75°F) at the beginning and end of the season. 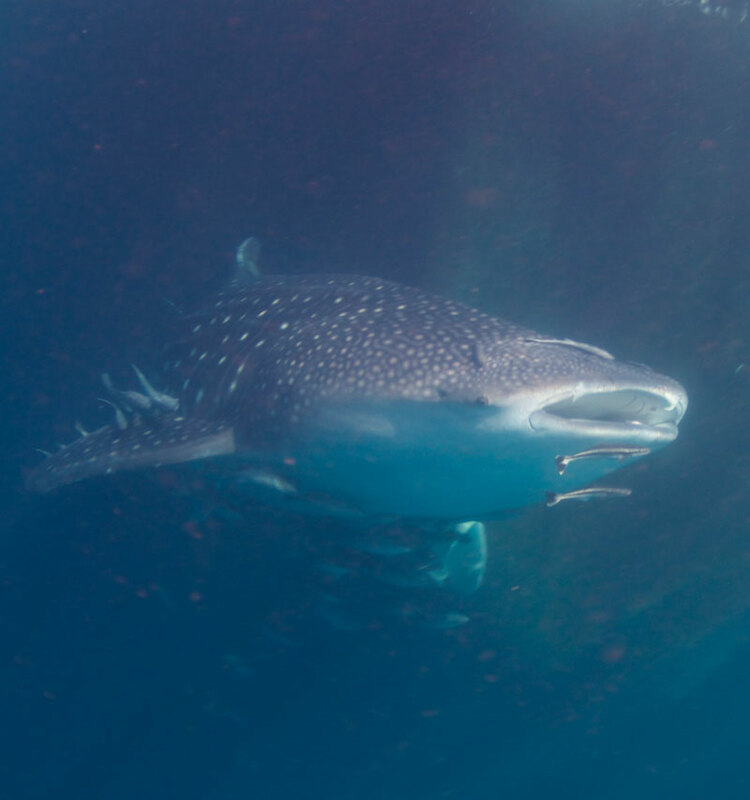 Whale sharks may be seen in the area from mid-November to early April. The best chance to spot them is during the new moon phase. Monsoon season starts at the end of June to September. This dive resort will bring divers to Triton Bay.